Anyone gutsy enough to take this countertrend setup on Guppy? A rising channel seems to be forming on its 1-hour forex chart while the pair is moving up to test the resistance near the 195.50 minor psychological mark. 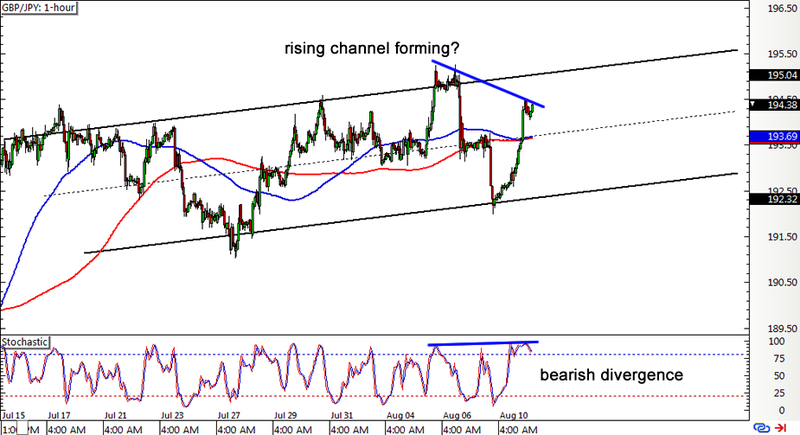 In addition, a bearish divergence has formed with stochastic making higher highs and price drawing lower highs. Unfortunately, the moving averages are just crossing back and forth, barely offering any strong hints on where the pair might be headed next. If the top of the channel holds as resistance, another test of the channel support somewhere between 192.50 to 193.00 could be in the cards. But if pound bulls continue to charge and this divergence fizzles out, GBP/JPY might go for a breakout! Here’s a potential break-and-retest situation on AUD/USD’s 4-hour forex chart. 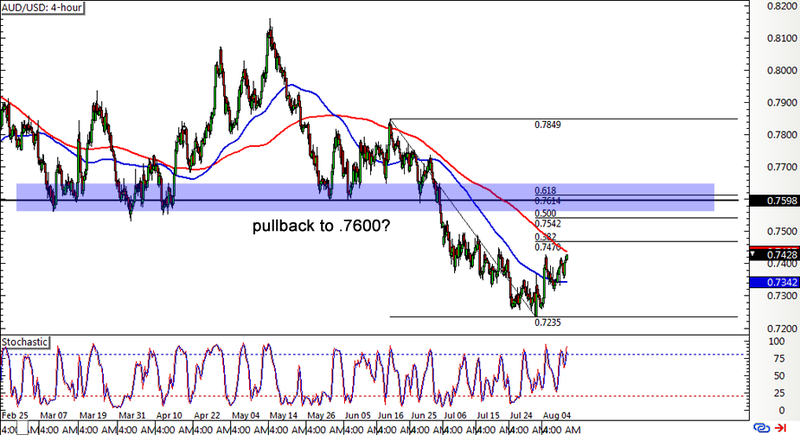 The pair broke below the key support area at the .7600 major psychological level back in June then moved all the way down to a low of .7235. From there, price consolidated and showed signs of pulling back, possibly until the broken support zone. Using the Fib tool on the latest swing high and low shows that the 61.8% retracement level lines up with the .7600 mark and might hold as resistance. Stochastic is already approaching the overbought region, indicating that sellers might take control soon and keep the correction shallow. The 200 SMA is close to the 38.2% Fib, which might also keep gains in check. 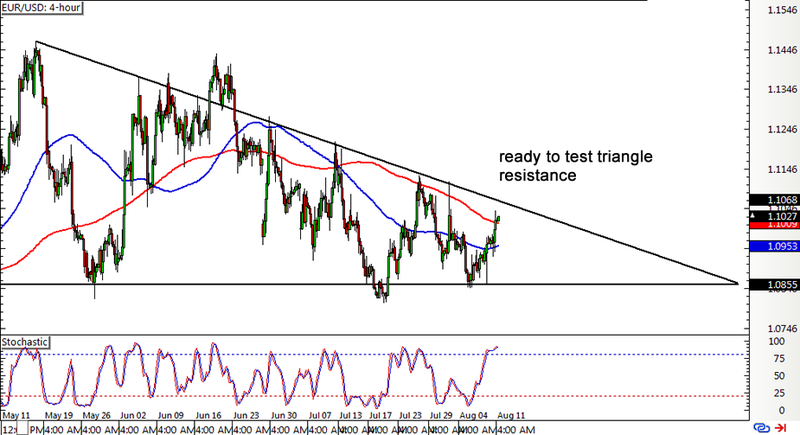 Looks like this EUR/USD descending triangle is still holdin’ up even with all the volatility last Friday! The bottom of the formation at the 1.0850 minor psychological level held as support and the pair is now making its way up to the triangle resistance at the 1.1050 minor psychological mark and the 200 SMA. At the same time, stochastic just reached the overbought area, which means that euro bulls might need to take a break and let the bears take over. The 100 SMA is below the 200 SMA anyway so the selloff is likely to resume. However, a long green candle closing above the top of the triangle could be a sign that buyers have gained enough energy to push for more gains. Note that the pattern is around 600 pips tall so the resulting breakout could be of the same size.